Orange Hair Dye There are 28 products. From beautiful, natural-looking auburns to bright orange hair color; fiery hair is the perfect way to express your fierce personality! The warm shades of orange hair dye compliment most skin tones, sparkle beautifully in the summer sun and inject some warmth into otherwise chilly winter wardrobes. Follow this easy guide to discover what orange hair dye you should choose. Shimmering ginger locks are a great way to cover up grays with a natural color. If your work place or school doesn’t allow for bright hair colors, a natural ginger shade is a great way to add a burst of color while still looking formal and smart. Natural orange shades like carrot orange hair dye can be very beautiful in a subtle way. Furthermore, many of our hair dye brands are vegan friendly, so you can look stunning and do your bit for animal welfare at the same time! You can read more about the different brands offering orange hair dye semi-permanent products below. 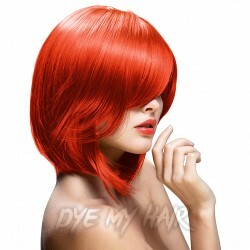 Fluorescent and neon orange hair dyes require you to bleach your hair thoroughly before applying, otherwise your natural hair color will stop the orange from being so bright. Semi-permanent neon orange hair is a very bold look that will really turn heads as you walk past… if you’re not ready for that level of commitment yet, try using neon orange for highlights or temporary hair stripes for your next night out. There are many different shades of orange hair dye, from pale pastel oranges to fiery oranges that verge on red and pink. Orange is a versatile color that you don’t need to be too careful with. Having streaks of slightly darker and lighter orange dye in your hair creates a flame-like appearance and adds further depth to the color. Temporary orange hair dye is a great option if you’re unsure just how bright you should go with your orange shades. Check out the great hair dye brands mentioned below to find hair chalks and wash-out dyes as well as orange hair dye semi-permanent products. La Riche Directions: Apricot and Mandarin are both very bright orange hair colors. Apricot is verging on a sunshine yellow-orange color while Mandarin is a more mature shade with hints of red. 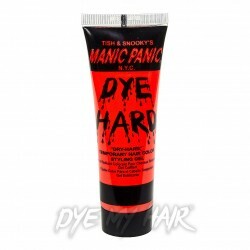 Manic Panic: the two shades of orange hair dye from Manic Panic are very similar – why not try using both? Psychedelic Sunset is a brighter, neon shade than Electric Tiger Lily which is more of a classic bright orange dye. Paint Glow: the ultimate natural ginger shade is Paint Glow’s Orange Thunder semi-permanent hair dye. 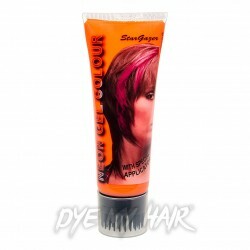 They also have a few temporary orange hair dyes including chalks and paints in neon shades. Stargazer: last on our list of best orange hair dye brands but certainly not least. Stargazer’s Dawn shade of hair dye is a classic orange color that’s neither too dark or too light. Hair Maintenance: before you dye your hair, use keratin and protein rich hair products in the days or weeks leading up to the day you dye your hair. You need to make sure your hair is strong and in good condition before applying any bleach or dye, whether it’s semi-permanent or temporary orange hair dye. Test Patches: test the bleach and hair dye orange color on your arm 48 hours before you dye your head. Watch carefully to ensure you aren’t allergic and like the color. If you have any side-effects from the dye, head to your nearest hospital for medical attention. Applying Bleach: you should bleach your hair before applying the dye. Even on blonde hair, you can ruin your bright orange hair color by having your natural hair color fade through. Following Instructions: read through the dye instructions on the box and follow them to the letter. If you leave the neon orange hair dye on for longer or shorter than they recommend, you may end up with a different shade than expected. Hair After-Care: you need to do some after care once you’ve applied the hair dye. Orange colors can fade quickly so keep using your keratin and protein-rich products to make your hair strong. Depending on the brand, you can keep your hair looking rich and bright for 6 - 8 weeks. Follow those tips and you’ll have beautiful orange hair just like the celebs. For stylish inspiration on how to wear your new orange hair, look no further than these 3 style icons. This alt-rock singer is as famous for her orange hair as she is for being the lead singer of Paramore. Hayley Williams has changed her hair a lot over the years, but we’ll never forget her all-over fiery shades of orange hair dye. Mixing neon orange hair dye with strands of vivid reds, pinks and yellows creates a rock look Hayley would be proud of. How much better would Twilight have been if Kristen Stewart had kept her orange hair during filming? Okay, so maybe it wouldn’t have improved the film that much…. But you can’t deny that the carrot orange hair dye really suited her style. The simple orange color she used gave her natural brunette hair a warm orange tint. To achieve this you can experiment with using hair dye without applying bleach. Back in 2010 Nicki Minaj wowed everyone with her dazzling bright orange hair color. She’s always been one step ahead of the crowd! Nicki went for an all-over, flawless color paired with bright make-up and a fashionable white dress: a look you can easily replicate for yourself. 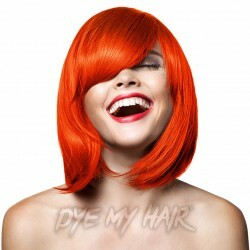 No matter what shade of orange you choose, shine bright with our range of best orange hair dyes available at Dye My Hair. It’s one of the most beautiful, precious hair colors in the world and for centuries, women and men alike have been wanting different shades of red hair. It is thought that only 1-2% of the world’s population have naturally occurring red (also known as ginger) hair, and that’s why a lot of us must resort to ginger hair dye! Why? Well because, who wouldn’t want to have bright, luscious orange hair? We’re all about ginger hair dye this season and it turns out so are the trends of the beauty and catwalk world, it doesn’t matter what shade it is, they’re loving every shade. You should be too, that’s why we’ve put together this article, to show you the best trends, styles and looks you can go for when you finally take that plunge in dying your hair ginger! Despite the myth, redheads actually originated in Asia not Scandinavia or Scotland. Most redheads have pale-skin, but it does look great with darker skin, it just doesn’t really occur naturally. The undertones of redheads can be anything from deep burgundy through to burnt red-orange and even strawberry blonde. You can get darker colors or lighter ones, as for dye, lighter shades of ginger take longer to achieve as they must lighten the hair follicles before dying. We advise anyone looking at going a light ginger to bleach their hair first and then putting the light ginger hair dye on. For those who are choosing a dark ginger hair dye, we advise to just simply put the dye on your natural hair. If you have very dark hair (like black or very dark brown) naturally then the ginger might not take to the dark ginger color at first, so you might want to buy 2 boxes of hair dye or go to the salon more than once, some of our brands also do red hair dye for dark hair that you could try too. Changing your hair drastically might change the look of your face so you should be careful that the color you choose is one that will suit you and your skin tone. Ginger is a really nice color to go for if you want to look elegant, chic and modest at the same time. Highlighted ginger hair is also a hairstyle you need to try out at one point in your life and what better time than now? You can highlight your ginger red hair color or you can put undertones in it and go darker. Whatever you decide, it is sure to look great. When getting a look like this done, it’s always an option to go to a professional salon with your selected dye as it’s can be difficult to create this look yourself. The fiery fade is another trend that is huge right now, this ombre style starts with bright, redhead orange at the top of the hair (by the roots) and ends fading into a light, peachy strawberry-blonde. Whilst looking intense it also creates a sense of softness, and innocence! If you’ve got a fringe this look is also a good idea, if you don’t then you might want to think about getting your own when you use this ginger hair dye on your hair! Ginger hair is just like other colors and isn’t hard to keep updated or maintained as it’s a natural looking color. You need not worry about bright blues or pinks that might be ruined by dark brown hair sneaking through, ginger works with your natural hair too! There are so many different styles that work with ginger hair too, just because your hair color is bright doesn’t mean you can’t shine and be the daring type you are. Whether you go for a short, cropped wavy bob or you’re more of the corkscrew shoulder-length type of gal. Anything works with your dyed ginger hair, especially curls. Although straight hair looks good, nothing beats a natural ginger curl to get heads turning your way. Styling your ginger hair has never been easier than simply using a curling wand or brushing it up into a ponytail. If you want to be even more adventurous you can try braiding your newly dyed ginger hair into a fishtail plait or French braid, they’re so convenient and keep the hair out of your face all day (so it’s good if you’re constantly on the move!). If you’ve got longer ginger hair then you might want to keep it half up and half down. A nice hairstyle for longer hair is to braid your hair halfway and keep the rest out, it’s classy and means you can rock the hair up or hair down look whenever you want. Probably the biggest decision you’ll have to make before whether you want your ginger hair dye semi-permanent or permanent, it is a big decision, so you will want to mull it over for a night or two. Get your hair ready for the change and as soon as you’ve got everything you need from our store get started right away for the best hair dye experience! After all, gingers have the most fun, right? Silver, gold, rose gold. Metallic hair color shades are the latest trend, but you haven’t seen a stunning metallic shade of hair color until you’ve seen copper hair color. There are so many hues with this metallic tone of red, from a passionate fiery flame to a passive sunset. Regardless of how you choose to wear your copper hair dye, one thing is for certain; you will never be sidelined or overlooked again! You will certainly be the center of attention. So let’s take a look at how you can transform your hair from dull to vibrant right in the comfort of your own home. If you are on a budget and you can’t afford a salon trip to get the copper red hair color treatment you’ve been dreaming about, not to worry there is help at hand. Here are some step by step instructions provided by professionals in the industry to assist you in applying your new copper hair color. To begin with, you will have to gather some tools to make your hair dye treatment as simple as possible. You should have most if not all of these items at home, if not, they will only cost you a couple of dollars to purchase. Things are going to get messy so wear an old T-shirt. Get your hair ready by brushing out all the tangles and knots. Divide your hair into 4 sections by parting it horizontally and vertically. Roll up each section and clip it into place, leave one front section out, you will start by dying this part first. Protect your skin from stains by applying the Vaseline on your ears and around your hairline. Put your rubber gloves on. Bleach your hair according to the instructions on the bleaching kit. Get your copper hair color ready by following the instructions provided on the box. Apply the copper hair color to half inch sections at a time; use the tint brush to apply the dye from the ends throughout the full length of your hair. Leave a gap of one inch between your hair and scalp. Use your middle and index fingers to massage the hair dye into your hair. Repeat the process throughout all four sections of your hair. Put a shower cap on for the length of time specified in the instructions. Once the time is up, rinse the copper hair color out of your hair until the water runs clear. After an hour, shampoo and condition your hair using the color safe products. Buy two boxes of our best copper hair color, the last thing you want is to run out half way through the process. If you have got long or thick hair, it is advised that you buy two boxes. Do a strand test. Yes, we know that you are really excited about dyeing your hair but you won’t be so happy when your beloved copper brown hair color turns out looking like swamp water! Do a strand test on an underneath section of your hair (about ¼ of an inch) so you can hide it if the color doesn’t turn out the way you expected. If the color is different after the strand test or you’re adding copper hair dye for dark hair, consider bleaching before adding the copper hair color. We recommend leaving the bleached hair for a few days before adding the additional hair dye. Don’t use the bottle in the box. Since you are aiming for a salon finish, squeezing dye straight onto your hair isn’t going to do the trick. Instead, pretend like you’re a colorist, mix the dye in a bowl and use a color brush for the application. We have a range of brushes and bowls available on our website. If you just want to add a few highlights, use a clean mascara wand or a clean toothbrush and apply the dye where the sun would normally hit your hair, this is generally on the tips and around your face. This will give you great natural looking highlights. Color works best on dirty hair, the color will penetrate the strands better so don’t wash your hair for 24 to 48 hours prior to applying the color. Copper and its many shades have been a classic showstopper for decades. But it takes a special kind of woman to pull it off in style and confidence. Here are some of your favorite stars who know how to rock a killer copper do. Christina Hendricks: The stunning Mad Men star rocks her red locks like a true vixen. Lydi Hurst: Sports a subtle but elegant ginger color in loose locks. Alison Hannigan: Ever since her Buffy days, her flaming copper red hair color has continued to bewitch us. Rachel Evan: Stepped out of her fiancé's dark shadow with her copper penny hair color. Jayma Mays: The Glee sweetheart keeps her copper shade in meticulous form. Marcia Cross: Looks flawless in her pure copper curls. Rose McGowan: Usually a brunette, but this beauty can handle a bright and rusty shade. Olivia Grant: Knows how to dress up her delightful coppery hair curls. Reni Lane: Her copper tresses have us green with envy. Tori Amos: Always gives us an eyeful with her flame colored locks. Experimenting with hair color is great; since there are so many shades of copper hair color, why not try them all to see which one suits you the best? With the help of our dyes, you can find the perfect copper dyed hair for you. 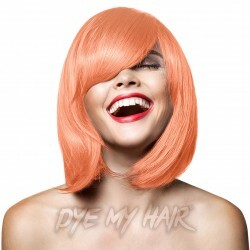 Now that you are ready to trade in your blonde or brunette mane for a shade of copper, why not check out www.dyemyhair.com you are guaranteed to find what you need here because there’s something for everyone. For an attention-grabbing style there is nothing quite like Dark Orange Hair Dye! Once upon a time bright orange hair only existed as a result of bleaching gone wrong, but over the past decade or so, pop-culture has seen more and more people deliberately taking the tangerine plunge. Believe it or not, the hair color orange is not a difficult shade to pull off. If it’s time for a change but you’re wondering if a color as out-there as orange could suit you, we’re here to tell you that yes, it can! Whatever your skin-tone, natural hair color or personal style, there’s a way to make orange hair work. When it comes to orange hair, our minds automatically conjure up the brightest of shades. While bright orange hair is undeniably stunning, it is not your only option when buying into this trend. Orange hair color shades essentially fall into three categories: dark, bright or light. You can use your natural coloring and personal style to determine which shade is right for you! Dark orange hair color was a seriously, smoking-hot trend of 2017 and that particular fire isn’t showing any signs of cooling down! The smoldering, copper-brown tones of dark orange hair suit most skin-tones, making this shade a safe bet if you’re unsure about vibrant colors or worried about changing your color dramatically. If you’ve got dark blue eyes, dark orange hair color could well be your shade. As dark orange and dark blue sit on opposite sides of the color spectrum they are considered complementary, which means dark copper locks will make your blue eyes pop like no other shade can! Brown orange hair dye typically has red undertones. While it is usually quite a dark color, it can also come in lighter brown shades with just the faintest zesty hue. This wonderfully complimentary shade will suit most people and can be a good option for those with naturally darker hair as they won’t have to lighten their natural color too drastically. If you want a delicate shade of orange to add a subtle and sophisticated warmth to your color, brown orange hair dye is the best choice. Now, let’s talk about bright orange hair color shades! Pale-skinned and cool-toned people often make the mistake of thinking they cannot pull off the most vibrant shades of sunshine orange. In fact, precisely the opposite is true! Extremely vibrant orange hair looks best against the porcelain pallet of pale skin and sets off bright blue or bright green eyes magnificently. Think Paramore’s Hayley Williams! Unfortunately, with great color comes great responsibility. Consider your immense good fortune at being able to wear bright orange hair balanced out with the work it can take to keep it vibrant. Just remember, you can prolong the life of truly radioactive orange hair color shades by washing in cool water with a color-preservation shampoo. It’s got to be orange hair dye for dark hair! If you’re a hair color addict with naturally dark hair, you’re probably well-acquainted with the challenge of achieving the desired shade when you dye your locks. The truth is, dark-haired people usually have their work cut out for them when it comes to making the color on the box a reality. Though if you’re considering orange hair dye for dark hair, things just got a whole lot easier for you! Medium to dark brown hair has orange undertones, which is why these shades are so quick to turn fluorescent orange if you so much as show them a bleach packet. However, if the color you intend to dye your hair with also has copper or orange undertones, it doesn’t matter if your freshly lightened hair is looking a little brassy. Whether you’re going for a bright or dark orange hair color, you’ll find you need to apply far less bleach than you would do prior to dyeing your hair any other lighter shade. Want to know how to dye black hair orange? You are going to have to lighten your hair, but with any luck, one treatment should be enough! An at-home bleaching treatment like Dye My Hair’s 30 Volume Bleach Kit will work just fine, as you do not need to eliminate all the copper tones from your hair. Remember to adjust your treatment time based on your desired shade and create a more even finish by covering your hair in cling film to trap heat. For this same reason, it’s a good idea to keep the room-temperature quite high as you’re waiting for the bleach to develop. If you’ve chosen a very pale or bright orange hair dye semi-permanent product, you’ll have to take your hair down to a blonde or yellow color, which may mean you bleaching it twice. If this happens, try and leave a week or two between treatments for your hair to recover! Crazy Color Semi Permanent Hair Dye in Orange or Tangerine. A medium-orange dye with red and brown undertones. Manic Panic High Voltage Classic Cream Formula in Psychedelic Sunset. A strikingly vibrant shade. We’re talking sunglasses all round! Paintglow Rebellious Colours Semi-Permanent Hair Dye in Orange Thunder. A smoldering dark orange hair color with rich brown undertones. Once you’ve finished dyeing your hair, if the resulting color is too vibrantly orange for your liking – don’t panic! You can easily cool it off with a blue or purple toning shampoo treatment. Then comes the aftercare! Try to avoid washing your hair for a good few days after you’ve colored it so that the fresh dye can settle. Last but definitely not least: always use color preservation products on your hair. That means shampoo, conditioner and styling products. These aftercare tips apply even if you haven’t had to lighten your hair first. That’s it from us, now it’s down to you to chase your tangerine dreams! Auburn hair is an excellent color choice for the fall and winter seasons. Auburn hair color offers beautiful red and brown hues that are a welcome change from the lighter colors of summer. Do you currently have a different color hair but are looking to change to a dark ginger? Or perhaps you already have stunning mahogany hair color and simply need a touch up. Whichever it is, we have everything you’ll need to get the job done right here at Dye My Hair. Step one of the dyeing process is to decide which color will suit you best. Now, there are many things to consider when choosing the perfect color fit. For example, you’ll want to research which colors work best with your skin tone. Some colors can accentuate your skin while others may be complimentary for a less drastic color combination. Of course this is just a guide; it really depends on what type of look you are trying to achieve. Consider your options and make your decision. Will you choose the red brown hair dye, dark ginger hair dye, or the auburn red hair dye? Would you want to use a permanent hair dye that will last for months to come or would you prefer something like an auburn hair dye semi permanent? After you have made those difficult decisions you can begin searching our awesome brands for that perfect shade. Here at Dye My Hair, we carry an excellent stock of high-end, top quality hair dyes. For example, you can choose from brands like Stargazer, Splat, Manic Panic, Paintglow, Crazy Color, Herman’s Amazing and La Riche Directions for all of your hair dye needs. Before dyeing your hair give it a nice deep conditioning treatment. A conditioning treatment will help moisturize your hair. This is beneficial to those considering dyeing their hair because well moisturized hair allows the dye to take to your hair strands evenly. Protein treatments will also assist with freshening up your dry and damaged hair. A haircut may also be in the cards for you before you attempt to dye your own hair. If you get a haircut a few weeks before you plan to dye it you will significantly reduce the amount of split ends you have. This is a great idea because the less processed and damaged your hair is, the more likely your new dye will look shiny and beautiful! Another important step you’ll want to consider is bleaching your hair, if necessary. For a beautiful auburn color you may not need to do this. However, if you have dark hair and you want to achieve a lighter look, you may need to consider doing this a few days to weeks before as it can be a lengthy process. If you need help with this step, consider using one of our Bleach Kits from Dye My Hair, we’ve got everything you’ll need to get the job done. Next, check to see if you have all of the proper utensils for dyeing hair. For example, a dye bowl will allow you to mix any color without all of the lumps and bumps. Put on your rubber or plastic gloves and mix everything together. After you’ve mixed your dye, use a dye brush to apply the auburn color to your hair evenly. Let it sit for the recommended time, rinse it out and voila! You’ve got a stylish new color. Great Job! Use shampoo and conditioners that are hair dye friendly. Avoid brushing your hair when it is wet. Wait a minimum of two days before washing your hair. Rarely use blow dryers, straighteners and curling irons to protect from heat damage. When utilizing heat, protect it with a proper hair serum. When all else fails, ask your favorite hair stylist for help. You can always take your new hair dye to them for assistance. In fact, when it comes to unique colors, they’ll be so happy that you have already done all of the leg work of finding that perfect fit. Step 4: Enjoy Your New Hair! That’s it; you’ve completed the journey to your new dark red auburn hair, now what? It is time for you to enjoy it, of course! 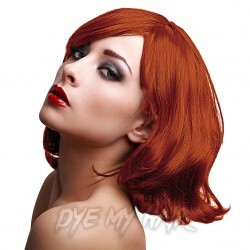 Dress yourself up, throw on some make-up and spend a night out on the town showing off your new dark auburn hair color. If going out isn’t your thing, maybe you’ll do a fun photo shoot or have a romantic date with your loved one; whatever you do, you’ll be doing it in style! Lastly, after you have spent weeks enjoying a beautiful new color, be sure to come back for a new shade or touch up dye. We love when our customers return for their favorite brands, we hope to see you visiting Dye My Hair again soon! Try out some intense orange shades with the Manic Panic High Voltage Classic Cream Formula Colour Hair Dye in Psychedelic Sunset! Are you seeking a vibrant new shade that'll totally transform your style? If so, then why not check out the Splat Long Lasting Semi-Permanent Hair Dye Kit in Orange Fireballs! Get a new hair colour that'll really help you stand out! 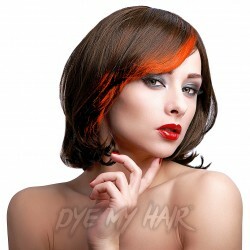 You gotta love the Crazy Color Semi-Permanent Hair Dye 4 Pack in Orange!